This coffee will be fresh roasted for you. 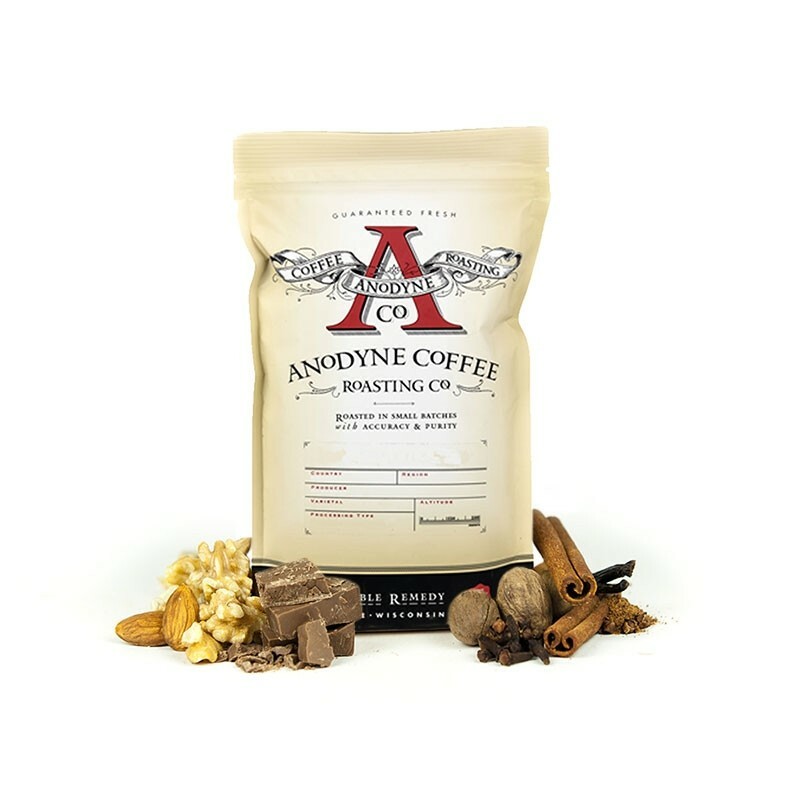 We expect Anodyne Coffee Roasting Co. will roast and ship this coffee in 1-2 business days depending on their roasting schedule. This is the Decaf Fool's Gold Blend brought to you by Anodyne Coffee Roasting Co. Decaf Fool’s Gold Blend is for those of us who love the taste and smell of coffee, but need to avoid the caffeine. This blend of two coffees is smooth and balanced with a mix of earthy and nutty flavors. Too acidic for my preference. Takes more effort to hand grand as well. Good flavor, but I prefer even more nutty and less earthy. This was not dark coffee. It smells good, but the taste is just meh. Definitely NOT worth $19.99. Complete waste of money. Took a little getting used to, but once I adapted to it I really liked it. Great it wasnt oily. Good smell. Brewed nicely. This is terrific. I love how drinkable it is. Much lighter than I prefer I am more of a dark roast Indo-Asian fan, like Sumatra. For me, this is OK adding about 10-15% to my darker blends as a light note, but that's it. Like the nutty taste, but not enough "coffee" taste. Needs to be a slightly darker roast, more body. This was very nice for a decaf. It actually held on to some of the more subtle coffee flavors that I like, and wasn't dominated by the dark roasty flavor that so many decafs seem to be. I'd prefer even more fruity and acidic, but this was one of my favorite decafs I've had. True to it's description. Medium body. More earthy than nutty which is a great thing in my opinion. Such a wonderful aroma when opening. The packaging is worth the read, top to bottom. Hello. Reminds me of McDonalds coffee which I like. PLEASE DO NOT EVER SEND FRENCH ROAST. It has a terrible burnt flavor. UGH! This was a solid cup and tasted as advertised. Nutty, but a little too bright/acidic for my tastes. I tend to like darker roasts, and this was a little on the light side. Coming from Lavazza Super Crema which is a medium expresso roast, I found the Decaf Fool's Gold Blend a bit light in body and a bit acidic for my liking. I've tried different grind sizes while preparing in my Chemex, but always had a sour aftertaste that I dislike in coffee. Adding milk and sugar actually made it worse in my experience. I think I must have accidentally hit decaf and do drink decaf but a majority of caf. Was not a huge fan of this we tried it today. My husband likes it it reminds him of the coffee he would get in Singapore. I am not a fan of the flavour which I would describe as nutty and not punchy enough if that makes sense? Delicious! Just enjoying my first cup! The delightful aroma is only surpassed by the smooth taste: earthy with a hint of cocoa. Loved this one. Smooth not too acidic. too mild, too acidic--as bland as Folger's . I will have to give the remainder away. I am definitely not impressed by this coffee or your sustem of choosing. She really liked this one! I had to grind this coffee on strong to get the taste I like. It reminded me of watered down Maxwell house. earthy and nutty. Maybe a bit overly bitter for me. Just getting used to "real" coffee! Pretty good cup of coffee. Better than Swiss Water but still not as rich as I'd like. I would like something with a little more chocolate or caramel flavors. Exactly as described. Ver flavorful. Very good. Noticed it creates a precipitate when Baileys is added which wasn’t desireable. Any idea what that’s about? I thought it was a great flavor for a decaf. I wouldn't mind a bit darker roast to try next time. Nice Coffee taste for a decaf. A great decaf coffee. As advertised a little nutty and earthy (and a tad fruity). Better than the Guatemala Mountain Water. Nice balance of flavors! Truly enjoyable cup. Would like more intense flavor. Less nutty, more chocolatey. Not a bold taste at all. Seemed to have other flavors rather than a true coffee flavor. Beans are not rich looking. The bean is lighter than what I'm used to so possibly that is why something is missing. This isn't as well rounded as I'd hoped, but still tastes pretty good. Solid, but I find Anodyne's coffee a little... well, anodyne.